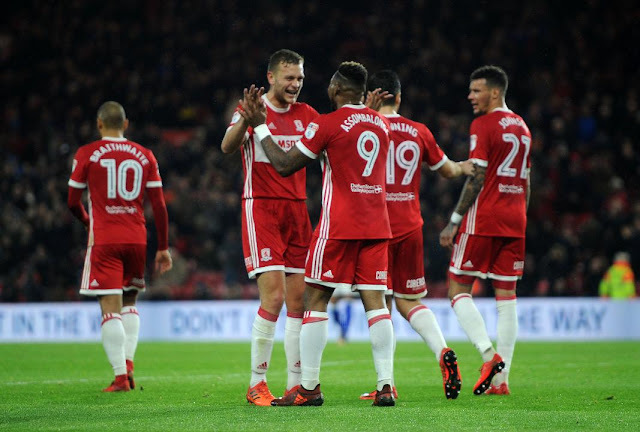 Middlesbrough moved back into the Championship play-off places as Britt Assombalonga's first-half double secured a routine 2-0 win over Birmingham City. Assombalonga took his tally for the season to 11 goals from 18 league games as the Teessiders bounced back from their weekend defeat to Leeds. His opener came courtesy of a close-range header, with his second seeing him rifle home a low finish from inside the area, and Sheffield United's Leon Clarke is the only player to have scored more Championship goals than the £15m man this summer. His double ensured Boro would record their fourth win in the last five matches, and while Garry Monk's side are still not firing on all cylinders, they are gradually starting to click into gear. Birmingham started the game with the worst defensive record in the Championship and lived down to their billing from the off. It took Middlesbrough just 10 minutes to break the deadlock, with their opener owing much to some shoddy Blues defending. Stewart Downing was afforded too much space as he cut in from the right, and when the former England winger left fly Tomasz Kuszczak could only fumble the ball into the air. Assombalonga reacted quickest, stooping to head home from the edge of the six-yard box. Boro dominated the opening 45 minutes, with Martin Braithwaite pulling the strings as he operated behind Assombalonga, but Birmingham twice went close either side of the half-hour mark. Daniel Ayala produced an excellent sliding block to prevent Jonathan Grounds from finding the target, before goalkeeper Darren Randolph displayed excellent reflexes to keep out Che Adams' strike after Sam Gallagher had nodded the ball back across the area. An equaliser at that stage might have made things interesting, but Boro took firm control of proceedings as they doubled their lead four minutes before the break. Fabio da Silva, recalled at left-back in place of George Friend, lofted a superb ball over the top of the Birmingham defence to release Assombalonga into the area. Boro's leading scorer steadied himself close to the penalty spot and produced a clinical finish past Kuszczak. The hosts continued to dominate in the second half and twice came close to adding a third goal either side of the hour mark. Assombalonga headed Cyrus Christie's cross straight at Kuszczak after peeling off to the back post, before Fabio cut in from the left-hand side to drill a crisp rising effort against the underside of the crossbar. Downing also whistled a decent second-half effort narrowly wide of the target, with Birmingham's only real sniff of a goal after the interval coming to nothing when substitute Jacques Maghoma shot into the side netting after Jota played him in.